Being Sunday, it’s First Born’s turn to cook. 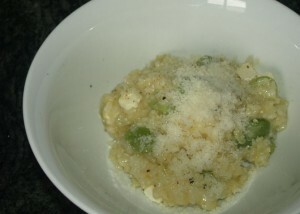 Tonight, he has whipped up a broad bean and feta risotto in the thermomix. I can’t say it often enough, the thermomix is absolutely brilliant for teaching children to cook. The risotto was fantastic and First Born was very proud of himself. As well he should be. He also demanded that I blog the recipe. So I shall. Place in an insulated bowl and stir through broad beans, feta and cream. Place lid on and allow to sit for 3 – 5 minutes so all the liquid can be absorbed. Serve with cracked black pepper. just made the best broad bean risotto in my thermomix. i used this recipe but i did not have fetta. so i put the risotto in the thermo saver. blended up Parmesan cheese, fresh parsley, mint & lemon rind. sprinkled over the top of risotto and put the lid on for 5 min.